A heavily pregnant woman with a serious heart condition was forced to sit on an A&E floor for five hours after patients and visitors refused to give up their seats. Bonita Baxter, 27, was rushed to hospital on Monday evening with chest and stomach pains and was advised by nurses to wait for treatment in case it was related to her condition. Mrs Baxter, who is six months pregnant, had to sit on the floor because Queen Elizabeth Hospital in Birmingham was so overcrowded. The mother-of-five, who suffers from Tricuspid regurgitation, a condition which causes blood to flow backwards through the heart valves, says she begged staff for a chair. She says a receptionist even pleaded with the patients and visitors to give up their seats but all 50 people in the waiting area refused. 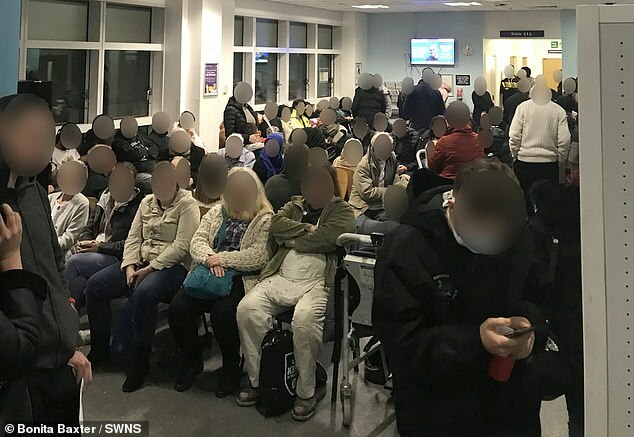 Mrs Baxter, from Shirley in the West Midlands took a picture of the packed waiting room which has since gone viral. Despite going against the advice of medics, after four-and-a-half hours, Miss Baxter called her mother who drove her to Solihull Minor Injuries Unit. She was given painkillers before being discharged. Mrs Baxter lives in Kings Heath, Birmingham, with her husband Ben, 33, and their five other children aged between one and six. She said: 'Throughout the day on Monday, I was in pain. I tried to get a doctor's appointment but had no luck. I thought I would ride it out and get an early appointment the next day. 'But the pain got worse throughout the afternoon and early evening. My husband rang an ambulance and they took me to QE. 'There were 15 ambulances ahead of us waiting to be booked in. It was like a traffic jam outside A&E. 'We initially went to the maternity unit at QE, but they said it was best to stay with the A&E in case I had a problem with my heart or the baby was at risk. 'I totally expected a wait but I was not expecting to have to sit on the floor for almost five hours. Hours and hours went by. 'Twice the nurse asked if someone could give up a seat for me. No one moved.. I just got blank stares and people looked at the floor. 'I knew these people had their own problems but it was obvious I was heavily pregnant and was in discomfort. 'If it had been the other way round I would have given up my seat for a pregnant woman. 'I would say 70 per cent of those waiting were patients - but some were visitors of patients. One patient had about six or seven visitors. One of those could have moved. 'It was just disgusting. I was really shocked. I am quite visibly pregnant. I am not saying I deserve to be treated like Royalty because I'm pregnant. As for the visitors - I just can't believe it. 'I don't think the staff were expecting it to be so busy. It was so uncomfortable on the floor. I was texting my mum and she came to the hospital. 'She said 'can no one give up their seat?' but again nobody moved. My mum took me to Solihull, and they sent me straight away with painkillers. Mrs Baxter and her husband Ben, a shopping centre security guard, have lodged a complaint with the Patient Advice and Liaison Service (PALS) at the hospital. 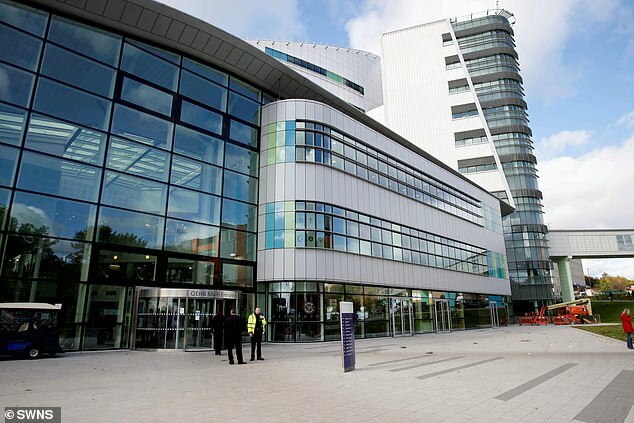 A spokesperson from University Hospitals Birmingham NHS Foundation Trust, which runs the Queen Elizabeth Hospital, said: 'Signage across the Emergency Department and members of our staff do ask visitors to give up their seats for patients during busy times. "Queen Elizabeth Hospital in Birmingham was so overcrowded." Ah yes America behold "Single Payer"